Here's why gerrymandering is such a big problem and how the courts might rein it in. | Circa News - Learn. Think. Do. 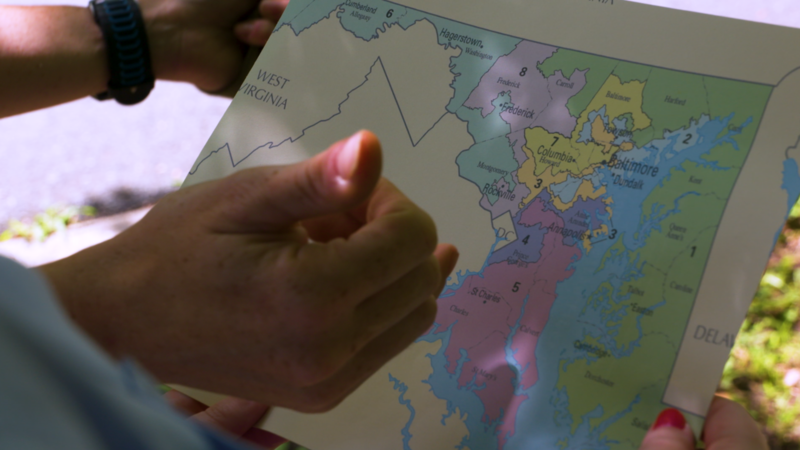 WATCH |Gerrymandering has become a big problem in states like Maryland where some neighborhoods have wound up split into as many as four different congressional districts. The paint-by-numbers congressional map could soon get a facelift due to some important court cases. Jennifer Bevan-Dangel has lived in the same house in Crofton, MD for 10 years, but in 2012 local officials redrew congressional district lines and split her community in half. "We have lived in two different congressional districts just by staying in the exact same house," Bevan-Dangel said. That line change is called gerrymandering, and it can cause a lot of problems in places like Crofton. It's the process of redrawing electoral district lines to give a political party an advantage in elections. "The way gerrymandering works is either packing or cracking," said Aderson Francois, a professor of law at Georgetown University. Packing is when Republican legislators, for example, draw district lines to "pack" Democratic voters into one or a few districts. Cracking is the reverse. That's when Republican legislators redraw districts to spread Democrats out so their votes don't hold much sway in largely Republican districts. "Either technique results in wasted votes," Francois said. It's not just Republicans, Democratic lawmakers are guilty of gerrymandering too and Maryland is a perfect example. In that state, the district lines have been redrawn over the years so that there's really only one Republican district and none of the elections in the last cycle were competitive. Gerrymandering is nothing new. In fact, politicians have been redrawing district lines to give themselves a political advantage since the early 1800s and it's led to some strange looking districts over the years. Those wonky district lines can cause big problems in communities that find themselves divided up among multiple congressional districts. Bevan-Dangel said her neighbors in Anne Arundel County have had a hard time petitioning lawmakers on important issues like hospital and school funding, and in many cases the districts become so confusing that people do not know who their representatives are. "If you're talking to your neighbors and you all have different representatives, it feeds into that sense of bewilderment, that sense of 'wait, who did you vote for, who did I vote for, what district am I even in?'" said Bevan-Dangel, who is also the executive director of watchdog group Common Cause Maryland. The confusion can be frustrating, but Bevan-Dangel said gerrymandering also makes people feel powerless in a rigged political system. "I have friends who are Republicans who live in this county and tell me that they don't vote." Gerrymandering can also lead to more partisan politics. "If we had fifty-fifty split districts where a Republican or a Democrat can end up taking it, you would see representatives who are coming into the middle, who are hearing from people on both sides of the aisle, and then feeling like they need to represent people on both sides of the aisle," Bevan-Dangel said. The "paint by numbers" congressional maps could be reigned in soon thanks to a slew of court cases challenging gerrymandering practices. On lawsuit headed to the U.S. federal district court of appeals in Maryland argues the state's Democratic-leaning districts violate Republican's first amendment rights. And the Supreme Court has agreed to hear a similar case out of Wisconsin where Democrats hope to prove gerrymandering is leading to a significant amount of wasted votes, violating their constitutional rights. Francois says the court will have to determine if there is a point at which officials gerrymander so blatantly "to the extent that it becomes almost anti-democratic." He added that until the court reaches a verdict on that case, other gerrymandering cases are in limbo. Bevan-Dangel says she's hoping the new attention to the issue can turn the tide on gerrymandering and get people to organize to de-rig the system. "The court attention to this is creating opportunities for change that we've never seen," she said. California has already taken steps to squash gerrymandering. In 2008, California voters passed Proposition 11 to create an independent state redistricting commission. A bipartisan panel then redrew the state's congressional map in 2011. While the balance of power did not immediately change after the redistricting, studies by the Public Policy Institute of California, the National Journal, and Ballotpedia found that California now has some of the most competitive elections in the country. "That ultimately is the goal to have the people back in charge of the process and not elected officials looking out for themselves behind closed doors," Bevan-Dangel said. Gov. Larry Hogan (R-MD) and former Gov. Martin O'Malley (D-MD) have both said publicly that they would like to see independent redistricting commissions formed to examine the gerrymandering in Maryland. Hogan proposed legislation last year to create a panel, but Democrats in the state legislature have called for national or redistricting reform instead.